The Bentheim Black Pied pig originated in Bentheim, Germany in the early 20th century when local breeds were crossed with Berkshire pigs and Cornwalls pigs. The Bentheim Black Pied pig became nearly extinct in the 1950s and is now a rare breed with about 100 registered breeding animals. 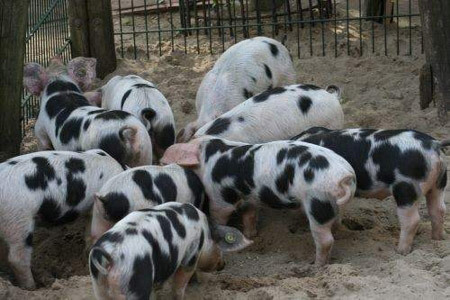 Bentheim Black Pied pigs are medium-sized, lop-eared and coloured white with black spots with grey rings. Boars average 75 cm height, 250 kg weight; sows average 70 cm height, 180 kg weight.